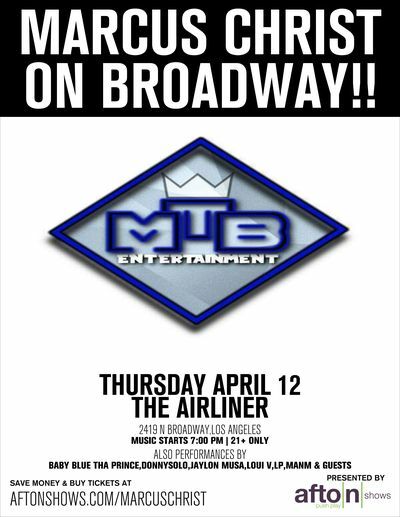 LOS ANGELES - March 7, 2018 - PRLog -- MtB Entertainment's artist Marcus Christ has just signed on to do his latest show at the Airliner on Thursday 4/12/2018. Marcus Christ completed a show a few weeks ago at the Lexington, and he is looking forward to his next performance. He has continually apologized to all his fans for the inability to give them the show they were waiting for last year due to legal issues, and he is happy he finally made up the show. The next show is at a well known venue called "The Airliner" where Marcus Christ hopes to perform his new single, "Shorty Wanna Gangsta", "If I Knew", and "I Didn't Think" live in a 15 min set!! Marcus Christ is still working with Afton LLC for the booking of this show. Most people now are wondering what Marcus will do on stage this time. Marcus Christ's videos and interviews are now being featured on Zevo Tv, Skilly Magazine, and Triple HQ along with other blogs and radio stations where they are becoming more popular. Marcus Christ released. "If I Die Tonight" and about 5 more music videos/singles after that. Some songs are new, some are redone, some are undone, but they're all hits. Marcus Christ is still financing a small radio campaign to bring awareness to his new singles. Marcus Christ says, "I think this new show will help make up for the mishap at The Lexington last year, and I'm hoping my next show at the Airliner will be an event well worth the wait".